Very well cut and polished, rich bright medium chrome color, eye clean. Choice matching suite for a special custom project! GTS10 1.12cts 7.6 x6.5mm pearshape Kenya $750. Very well cut and polished, AAA color, eye clean. Super pendent gemstone! 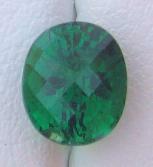 GTS11 1.29cts 6.8 x 5.7mm checkerboard oval Tanzania $380. Well cut and polished, AAA color, lightly included. Beautiful ring stone! GTS3 .50ct 4.8 x 4.7mm round Kenya $200. Slightly out of round, very bright gem! AAA color, very slight inclusions. Much nicer than photo. GTS6 .85ct 5.5 x 5.0 mm cushion Kenya $300.